With swine flu the top topic on the public’s mind last week, local television news stations and cable news networks remained the most frequented sources of information for Americans (cited as a news source on the subject by 69% and 63%, respectively). But the latest Pew Research News Interest Index survey also finds that about half the public (49%) turned to the internet for information about the virus. Moreover, asked which news source had been most useful in this regard, 25% of respondents named the internet, putting it at the top of the list of information sources in terms of utility. Which websites were the most frequented sources? This phenomenon is amply illustrated by Google’s own search trend tracking. Much like Pew Research’s News Interest Index poll, the graph, tracking the volume of Google searches within the United States during the past 30 days, shows a sharp spike in swine flu interest over the last week in April (far steeper than interest in either Supreme Court Justice David Souter, who announced his resignation that week, or in Chrysler, which filed for bankruptcy), with a fairly rapid dropoff in interest at the start of May. Web Search Volume: cdc+centers for disease control. United States, Last 30 days. The prominent position of the CDC on these lists may be owing in substantial part to the government’s earlier recognition of the usefulness of Google search tools in tracking the actual spread of diseases. Google’s Flu Trends tracks certain search terms to estimate possible flu activity at a state level – and it does this far more quickly than the CDC’s standard surveillance system can. Google shared its data with the CDC during the 2007-2008 flu season and analysis has shown that the near real-time search data were remarkably accurate in tracking the actual outbreak of cases across the country over the last five years. The website iHealthBeat reports that Google hopes to map other diseases worldwide in the future. CDC and the Department of Health and Human Services also hosted an hour-long town hall meeting on their respective websites while staff members tracked public reactions on various social networking sites. And Google itself prominently displays an advisory telling users to consult CDC for the most recent official updates on swine flu, while CDC itself has an informational flu prevention posting in the margin of the Google Flu Trends page. Goggle Trends show no surge in searches for popular privately run health information websites such as WebMd. But frequent users of such sites are likely to access them directly. 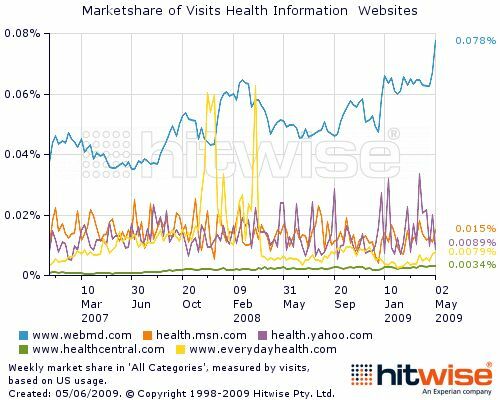 And a Hitwise analysis shows that while most of these health-information websites show no clear uptick in visits as concern about the swine flu peaked, WebMd, the most popular of the group, showed a sharp increase in the frequency of visits. Moreover, Tancer’s review of the top search terms sending traffic to WebMd for the week ending May 2, 2009, shows that queries relating to swine flu symptoms are the most common on the list. You can find more about the interaction of health and the internet at pewinternet.org. 1. Searches over the same period for the term “H1N1” — the official name for swine flu — yielded a roughly similar, though slightly more academically-oriented list: 1.www.wikipedia.org; 2. www.cdc.gov; 3.News.google.com; 4.www.fas.org; 5.Jama.ama-assn.org; 6. www.facebook.com; 7. www.yahoo.com; 8. Environment.guardian.co.uk; 9. www.pubmedcentral.nih.gov; 10. www.bloomberg.com. 2. Tancer notes that the frequency of social networking websites may be inflated by noise in the data resulting from the association of search terms with websites based on the sequence of visits, i.e. if a user, in a multi-tab environment, makes a swine flu query, than flips over to a social net site before reviewing the results of the search, the query may be incorrectly associated with the networking site. 3. The current count of followers is considerable higher than the 45,000 reported by the Post as recently as April 30. The website XKCD provides additional insight into ways in which Twitter can enable you to watch uninformed panics unfold live.